After almost three years of AQUACROSS running with our case study at the Ringsjön and Rönne catchment in Skåne, it was time for me to present preliminary results and discuss current questions related to model and scenario analyses for this case. 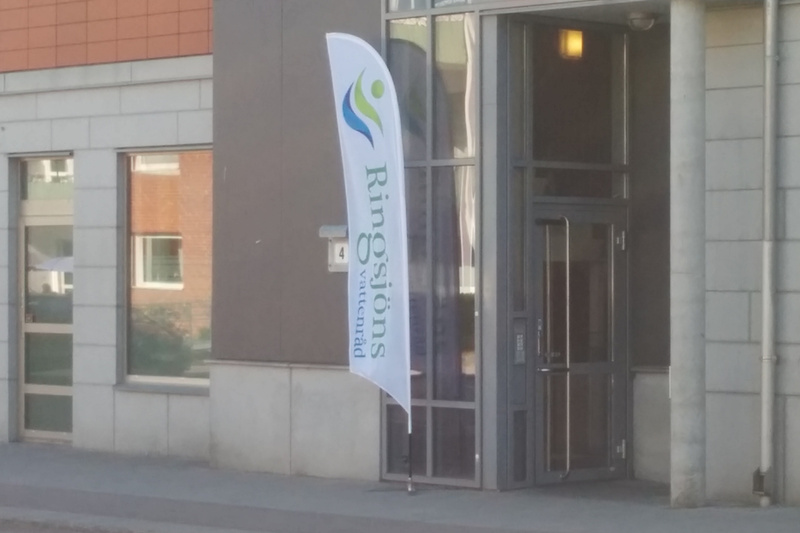 The water council from Ringsjön had their annual meeting last week in Höör and I got the opportunity to visit them for a short presentation. The entrance sign for the annual meeting of the Ringsjön water council in Höör. How does the lake water quality influence the aquatic ecosystem services in the lower river catchment over time? Answers to this question could motivate a larger, cross-boundary collaboration and we hope to support this via stylized model simulations. This work builds on an earlier model which we used to examine time lags from managing a eutrophied lake to restore a clear state (Martin and Schlüter 2015). It is exciting to extend this model for an ecosystem service analysis since non-linear changes over time and the fact that ecosystem services are co-produced (Palomo et al. 2016) are rarely integrated to model based scenario analyses so far. 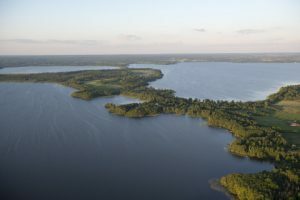 The three basins from Ringsjön in Skåne (picture from ringsjon.se). Another motivating factor to visit the water council is their general curiousity and openess to work together with scientists, where the diversity of knowledge around freshwater management is collected and shared. An illustrative example was given by Per Nyström presenting the recent report on the effects from biomanipulation at Ringsjön between 2005 and 2017. While the nutrient level has dropped almost to pre-eutrophication levels, the abundance of piscivorous fish (zander, perch and pike) did not increase as expected probably due to high fishing pressure. However, the conditions from the individual fish, benthic fauna and macrophytes show clear signs of improvement. Per presented clear indicators for how long biomanipulation needs to be continued before one can expect the self-reinforcing feedbacks becoming strong enough for the clear water state. It remains to be seen how the different fisher groups (business, recreation, and sport) could cooperate on this endeavor. Finally, I want to thank Louise from Albaeco for helping me on preparing the Swedish presentation and all members from the Ringsjön water council for their valuable contributions in our discussion and their patience during my first, far from perfect, Swedish presentation.